Some critics attacked Oliver Parker's recent version of The Importance of Being Earnest for its attempt to make a movie out of this most hermetic of drawing room comedies. His strategy? Introduce improbable dream sequences and foolish flashbacks of made-up histories for some of the characters. Parker's desire to "cinematize" the movie is understandable given modern audiences' impatience with filmed plays, but it can also be read as a specific response to the faithful, almost idolatrous approach to author Oscar Wilde's The Importance of Being Earnest seen in Anthony Asquith's celebrated 1952 version. And while Parker's film fails in just about every respect, there's something to be said for the idea of opening up the play. Asquith's version, recently released on DVD from The Criterion Collection, goes to the opposite extreme. Essentially a photographed record, albeit in enameled Technicolor, of The Importance of Being Earnest starring some of the top British stage and screen talent of the period, the film has little cinematic interest. And, equally problematic, by surrendering the movie entirely to the play's gratingly superficial characters and their exhausting parade of bon mots, it actually throws into high relief The Importance of Being Earnest's flaws. 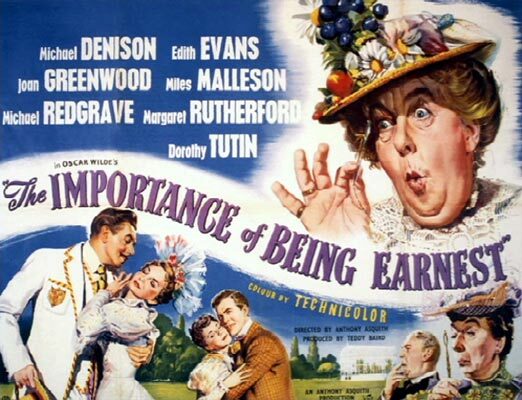 Above all, The Importance of Being Earnest is treasured for its epigrammatic dialogue, which Asquith gruelingly catalogs. The famous "All women become like their mother. That is their tragedy. No man does. That is his." comes from Algie. Lady Bracknell has a litany of lines: "To lose one parent, Mr. Worthing, may be regarded as a misfortune; to lose both looks like carelessness!" or, of a friend whose husband died, "I never saw a woman so altered. She looks twenty years younger." To which Algie adds, "I hear her hair has turned quite gold from grief." Even the character who most approaches the human, Miss Prism, becomes a spokesperson for Wilde's cynicisms. Told of the "death of Earnest," she says, "What a lesson for him. I trust he will profit from it." The Criterion Collection DVD shows off the Technicolor to good effect, with only an occasional bit of jumpiness or color shifting. Extras include a photo gallery and an informative essay by historian Bruce Eder that includes, among other things, the fact that Asquith's father, Herbert, was one of the officials responsible for Wilde's prosecution. We could thus read his version of The Importance of Being Earnest as the revenge of Asquith, a gay man whose sympathies were clearly with Wilde, on his father and the forces he represented. Gary Morris is editor and publisher of Bright Lights Film Journal (http://www.brightlightsfilm.com). He writes regularly on film for the Bay Area Reporter and the SF Weekly (http://www.sfweekly.com) and is the author of a 1985 monograph on Roger Corman (Twayne Publishers).